The Kiwanis Club of Presque Isle recently made a donation to The Sargent Family Community Center to sponsor the local Hot Shot competition. 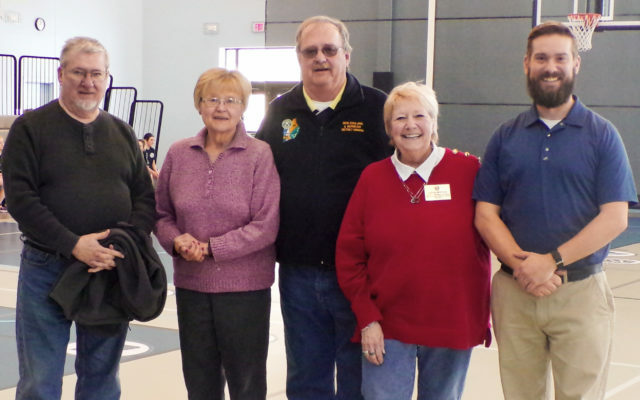 PRESQUE ISLE, Maine — The Kiwanis Club of Presque Isle recently made a donation to The Sargent Family Community Center to sponsor the local Hot Shot competition. Andrew D. Perry, program director for Presque Isle Recreation & Parks, accepted the donation. The Maine Recreation Parks Association (M.R.P.A. )/Red Claws Hotshot competition is a basketball skills competition for youth ages 9-15. Hot Shot involves shooting from five “hot spots” marked on one end of the basketball court. The competition tests each contestant’s speed, shooting, dribbling and rebounding ability. Each participant must first compete in a local Hot Shot event sponsored by a community recreation department in their area. All category winners and runners-up of local events then advance to a regional competition. The Hot Shot regional host sites are divided up into five regions: 1) Northern; 2) Eastern; 3) Central; 4) Southeastern, and, 5) Southwestern. After the completion of all five regional events, the winners and runners-up of each category will go on to the state Hot Shot competition in Portland.